Rubber tubing is used to transport liquids and gases. Black rubber tubing is not a kind of tubing so much as just a color; there are no attributes that black rubber tubes have that others do not. 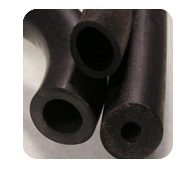 Black Rubber Tubing – Atlantic Rubber Company, Inc.
Like all other types of tubing, black rubber tubing ranges in inner and outer diameter to accommodate the desired fitting, connection or attachment. Both types of rubber, natural rubber derived from latex, a sap found in certain plants and trees, and synthetic rubber which is man-made from artificial components, can by colored to produce black rubber tubing. Gum rubber, neoprene, silicone, latex and other materials result in variations in the tubing with different characteristics. Rubber is used in many different applications and can be found in many aspects of daily life. Rubber tubing is also widely used and is important to many industries, including medical, pharmaceutical, chemical, laboratory, food and beverage processing, sports, manufacturing, hydraulic, pneumatic and specialty applications. For example, surgical tubing carries away fluids from the suction instrument while tubing in a fountain pop machine carries the viscous syrup to the dispenser. Those tubes are usually clear or lightly colored so the contents can be seen. Black rubber tubing is generally used for industrial or manufacturing applications to minimize or hide the presence of the tubing. Its heat absorption is better than any other colored tube and it can provide insulation or heat retention. Natural rubber is derived from latex, a milky substance that is produced by certain plants, most notably the Pará rubber tree. The latex is mixed with water and other materials to thicken it. Depending on the intended application, different chemicals are added to impart desirable characteristics, such as enhanced flexibility or electrical conductivity. It is during this step that the white latex is dyed black. The colorants that make it black are accepted more readily by some materials while other tubes are best left uncolored, which results in a light tan color. Other tubes are molded or extruded, a process in which raw rubber material is forced through an extrusion die. Another manufacturing technique is mandrel curing, where long thin cylinders called mandrels or arbors are dipped in rubber. Latex tubing, for example, can be made through this dipping process and, as a result, is smooth and seamless. The rubber undergoes a drying and curing process. When sulfur and heat are applied to rubber products in the right proportions, a process called vulcanization takes place, and the rubber becomes hard and mostly inelastic; vehicle tires and shoe soles are vulcanized. Synthetic rubber is processed in a similar way, except it is not found in trees but is a manmade derivative of petrochemical products. Black Rubber Tubing Black rubber tubing is made from either a natural or artificial elastomer that has undergone a finishing process that colors it black and leaves it highly flexible, tear resistant and resilient.